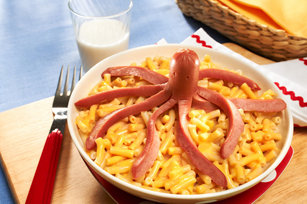 Try a kid-friendly octopus recipe: No octopuses were harmed in the making of this Macaroni & Cheese and Hot Dog Octopus Recipe! This octopus is a hot dog. Cut wieners lengthwise in half, starting each cut about 1 inch from one end of each wiener. Roll each wiener one-quarter turn and cut a second lengthwise cut, again starting about 1 inch from uncut end. (This will form 4 legs for each octopus.) Use sharp knife or kitchen shears to cut each leg lengthwise in half, about 1 inch from uncut end, creating a total of 8 legs for each octopus. Poke 2 holes into the uncut portion of each wiener for the eyes. Prepare Dinner as directed on package, using the Light Prep directions. Meanwhile, add wieners to separate saucepan of boiling water; cook as directed on package, watching each wiener turn into an octopus right before your eyes. Spoon Dinner into 4 serving bowls; top each with a wiener octopus. Serve this dish with your child's favorite vegetable, such as baby carrots or sliced carrots.